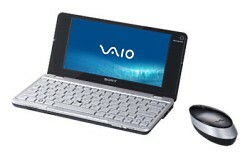 Sony Insider is reporting that the 8″ Intel Atom-based Sony VAIO P series could be undergoing a refresh in coming months. Keep in mind that not all models currently available elsewhere, are available in the US – US VAIO P models are currently limited to 1.33GHz Atoms. While the built-in GPS, high resolution display (1600×768) and other features for the not-quite-a-netbook have impressed some, others in the US have wondered about the CPU speeds. SonyInsider dug up some potential new model numbers – currently in the US, all of the models start with 5, aka as part of a 500 series ( VGN-P598E/Q, etc. ), but they’ve produced model numbers that look to be part of a 700 series (which as they point out, keeps in line with Sony naming schemes). The Q designations are interesting, because of the P730 instead of P710. I agree that they’ll probably be a different CPU, SSD option, or possibly Windows 7 variants, since companies are starting to make plans for Windows 7. Windows 7 is a natural fit, and it’s already been demonstrated on the VAIO P (albeit unofficially). This entry was posted in Announcements, Intel Atom, LED Backlighting, Netbook, News, OS - Windows 7, Solid State Drives, Sony. Bookmark the permalink.